← Winter Break or Spring Break: Who’s Keeping Your Home Safe? There’s a saying: “In Spring, a young man’s fancy turns to thoughts of love.” But in Spring a young junkie’s fancy turns to thoughts of break-ins, too! When the temperature approaches freezing, burglaries tend to go down. But when Spring is in the air, crimes rises. Come Spring, many a family likes to air the home out by opening a few windows. There’s nothing a criminal likes better. If you absolutely must open your windows, try to open it on an upper floor. Or arrange it so it can only be opened so far. Sometimes a wooden rod placed in the side frame will keep a window from being opened more than a few inches, and keep your home safe. But whether you use one or not, never leave a window open unless the window is locked in a way that it can’t be opened further from outside. And even if it is, close it if you leave the room. Unattended open windows are an open invitation to crime. But most criminals don’t enter through doors, say the statistics. Where do criminals usually enter? The front door. Standard locks screwed into soft wood can easily be kicked in. But not if you use mounting screws that are three or more inches long, on a deadbolt lock with a solid plate, on a door that’s solid wood. It may cost a little more, but a lot less than a robbery will cost you. Outdoor lights. Motion-detector flood lights. Low-voltage pathway lights. Even just plain old keeping regular lights on all night long. They all keep crooks away. You hear a burglar. You call the police on your phone. But will they arrive at the right house in time, if they can’t see the numbers properly? Check and see if tree branches are obscuring your house numbers, or if your house numbers are clearly visible at night. And even if they are, consider replacing them with reflective house numbers. Not only could it help police reach you faster, ambulances and other emergency responders will be able to find your house more rapidly and surely too. Saving your life comes first. But a lot of burglaries take place when no one is home. Don’t neglect your property. Physical safety is important, but you can do a lot to ensure your property’s safety even if you’re away on a Spring break or Spring vacation. How? Get your camera out and take snapshots of your valuables, clearly recording the make, model and serial numbers. When it comes to tracking or claiming your stolen goods, or filing insurance claims, they could prove invaluable. Let’s face it: a good security system will do tons more than no security system when it comes to keeping you and your loved ones and your valuables safe. That’s a no-brainer. Which one should you get? 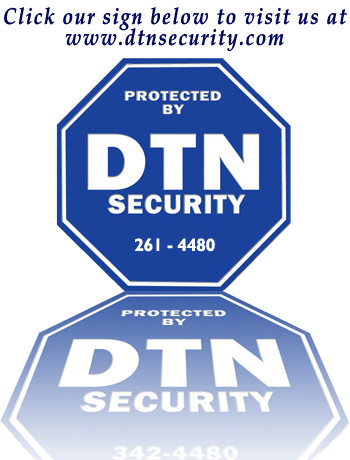 Of course I recommend DTN Services’ Home Security Systems; a visit to www.dtnsecurity.com will show you why. Gas prices are up, oil prices are up, food prices are up, but DTN’s prices are same as ever — and you may be surprised at how many new wireless and other options there are nowadays, and how we can make arrangements that suit your budget, situation and lifestyle. So what’s the very best Spring safety tip of all? Simple: call us. 585.342.4480. We’ll give you a Home Security assessment in person. Free. There’s no better way to be sure your home is all set and safe for Spring.